Amity Entrance Exam. Being a post graduate in agriculture I had an objective to polish my skill set for which no other course suited me well. 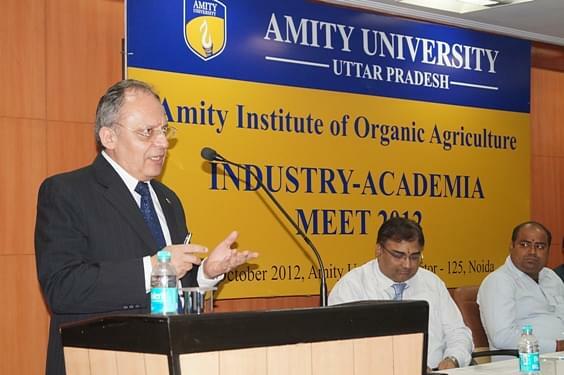 Amity Institute of Organic Agriculture - [AIOA], Noida, Uttar Pradesh is one-of-its-kind institute in the country. The university is reputed in India for academic excellence, international tie-ups, quality research and the scope of industry interface. The founder president of the university, Dr. Ashok K Chauhan is credited for establishing the university and granting it the present status. The institute has consistently set standards towards human resource development. With strong belief in Organic Agriculture, the institute has been taking steps in sustainable agricultural technologies. It has been supporting basic and applied research in organic production management systems, innovative farmers’ knowledge management along with training, advisory and several consultancy services. The college has included ISO standards in required courses that are offered by the globally reputed BSI Management Systems. The curriculum of the college even includes courses on several foreign languages including French, German and Spanish. Why to join Amity Institute of Organic Agriculture - [AIOA], Noida, Uttar Pradesh? 1. Choice amid several courses- The institute offers students an opportunity to pursue the course of their choice. The students get sufficient exposure in agriculture, entrepreneurship, management and others. The academic curriculum of the college is backed by apt educational infrastructure. 2. Exposure to industry perspective- The curriculum of the college is well-designed and offers students a choice amid 12 elective courses in agriculture and food business domain. It meets the requirements of the industries in the field of agriculture, production, operations, marketing and distribution, procurement, logistics, agri-food businesses, supply chain, retail management, rural business management and related sectors. 3. Opportunity of Hands-on experience– Besides academic preparation, the college has been offering hands-on experience to the students in production technologies as well as diversified agricultural enterprises. The students get to learn organic conceptualized farming, business analysis and even interpretations. Which is better SNAP or NMAT? Compare and Decide!